LAKE HURON IS ONE of the five Great Lakes and is named for the Hurons, a Native American people who once lived along its shores. Lake Huron covers 23,000 square mi (59,570 square km) and is 206 mi (332 km) long. At its greatest width, it is 193 mi (295 km) across. It lies at an elevation of 577 ft (176 m) above sea level and is 750 ft (229 m) deep at its deepest point. Lake Huron is connected to Lake SUPERIOR via the St. Mary’s River. The Soo Canal, with four locks on the U.S. side and one on the Canadian side, allows ships to pass the rapids, at which important hydroelectric stations have also been built. Lake Huron is connected to Lake MICHIGAN by the Straits of Mackinac, which are so wide that some hydrologists argue the two lakes are actually two lobes of a single lake and are regarded as separate only because of a historic accident: The first French explorers in the area discovered the lakes’ southern ends long before discovering the straits. Lake Huron flows into Lake ERIE via the St. Clair River, Lake St. Clair, and the Detroit River. Lake Huron contains the largest number of islands of any lake in the world. Manitoulin Island is the largest of them and delineates the North Channel and the west side of Georgian Bay. It is also the largest island in a body of fresh water. Mackinac Island, in the Straits of Mackinac, is a tourist resort well known for its picturesque scenery and complete absence of motor vehicles. During the Gilded Age, the great captains of industry regularly stayed on Mackinac Island to escape the sweltering summer air of their Chicago townhouses, and their wives enjoyed promenading on the Grand Hotel’s large veranda. Manufacturing is the source of 80 percent of the area’s income but has resulted in dangerous levels of pollution. Among the notable industrial cities on the shores of Lake Huron are Flint, Midland, Bay City and Saginaw in the U.S. state of MICHIGAN, and Sarna, Ontario in CANADA. The lake itself carries considerable traffic in raw materials and finished goods, with seven deepwater U.S. ports and four Canadian ports. 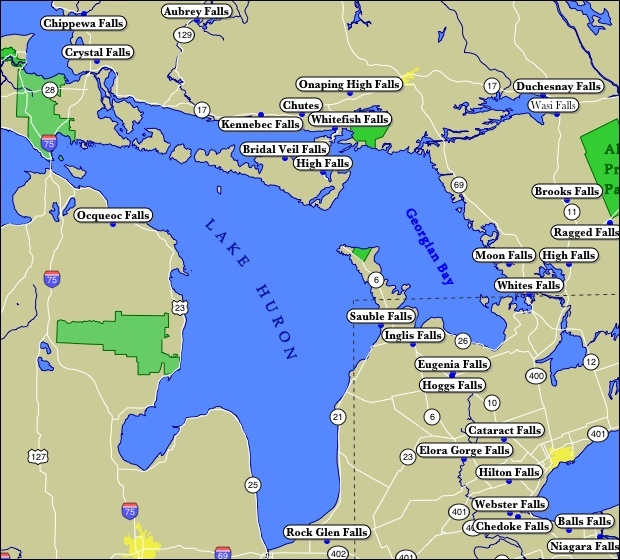 The Lake Huron area is rich in mineral resources, timber, and mining. Agriculture in the area centers primarily around dairy farming, although there is some row-crop and fruit cultivation. The shores of Lake Huron remain rich with wildlife, and the lake itself boasts a wide variety of fish. However, industrial pollution has made the consumption of lake fish medically risky, leading to the severe curtailment of commercial fishing in the area. Sports fishermen have continued to pit their skills against the lake’s fish but are warned against eating substantial amounts of their catch.